If you’ve been reading this blog for any length of time, you’ll know that, when it comes to prints, I have two great loves: stripes and polka dots. In recent years, I’d say stripes have definitely become my favourite: I still love my dots, but find they can sometimes feel a bit costumey at times, whereas stripes will almost always look classic, no matter how you wear them. I have a huge (and constantly growing) collection of striped items, which I wear all year round: it’s in spring and summer that they really come into their own and start to dominate my wardrobe, though, as a series of vaguely nautical-inspired outfits come out to play. I’m a big fan of almost any combination of red, white and blue – and that’s why I think these sandals would fit so effortlessly into my spring/summer wardrobe. 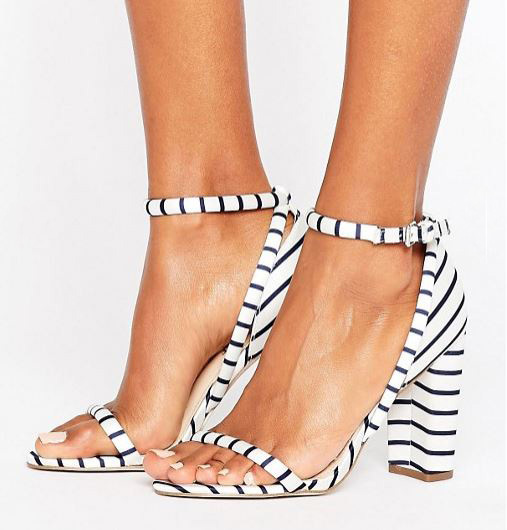 Not only are these the perfect colour/print to go with all of the aforementioned nautical colours I like to wear, the thick heel also makes me think they should be reasonably comfortable to wear, too. The predominately white upper has a wonderfully fresh feel to it, and I can imagine wearing these with either a white sundress or pair of red trousers/jeans, depending on the weather and my mood. Best of all, these are currently on sale at ASOS (With most sizes still available at the time of writing, although don’t blame me if they’re gone by the time you read this! 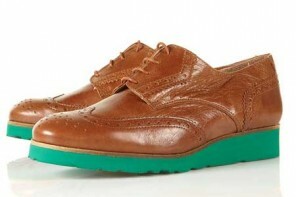 ), for £46 – so maybe not exactly the bargain of the century, but you will at least save a bit on them – and just in time for the best of the summer, too!